Great read - and fair criticism! This was such an important era in Legion history but I think this Treasury's reputation has gotten a little unfairly inflated - it lives very fondly in our memory, but going through it today . . . ? 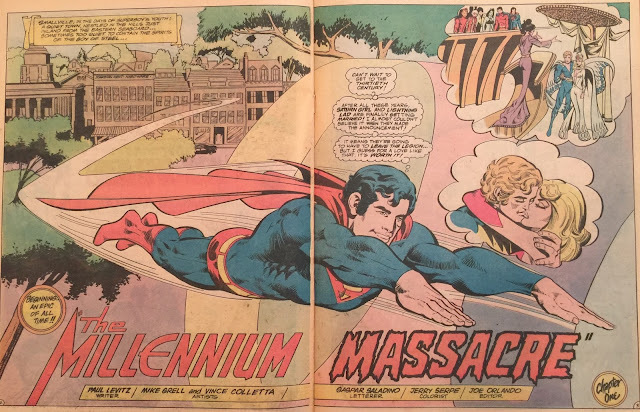 Mike Grell's designs should have leapt off these tabloid pages, and in some cases they do, but ultimately I think the illustration would have benefited from a different artistic pairing. I appreciate you reproducing those James Sherman profiles - THOSE leap off the page! I couldn't agree with you more. It should have been an "ooh, ahh!" 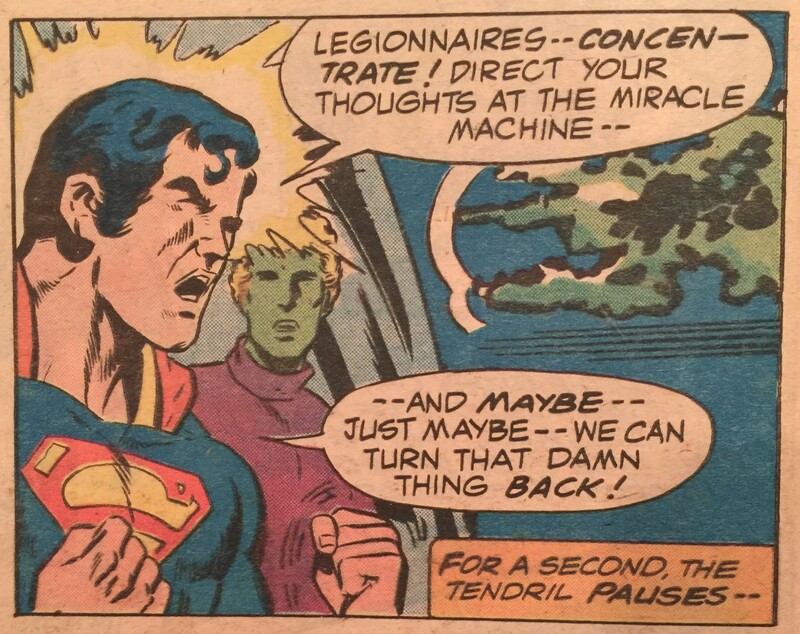 moment to have Mike Grell back on the Legion. I really think that Vince Colletta had something to do with our perception of the final presentation. 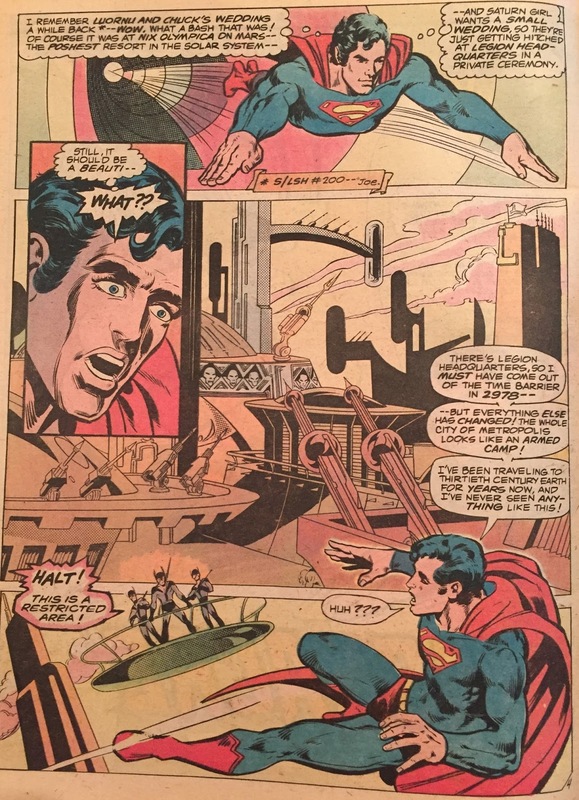 I'd have to dig back into the monthlies to see if there were backgrounds in many of the panels - it's certainly noticeable here that there are not. Those little Legion bios are cool, aren't they? As a kid, I think I spent as much time on those pages as I did the rest of the book! Great review and discussion of a book I only remember seeing in DC house ads. I never saw this on the magazine racks at the time. 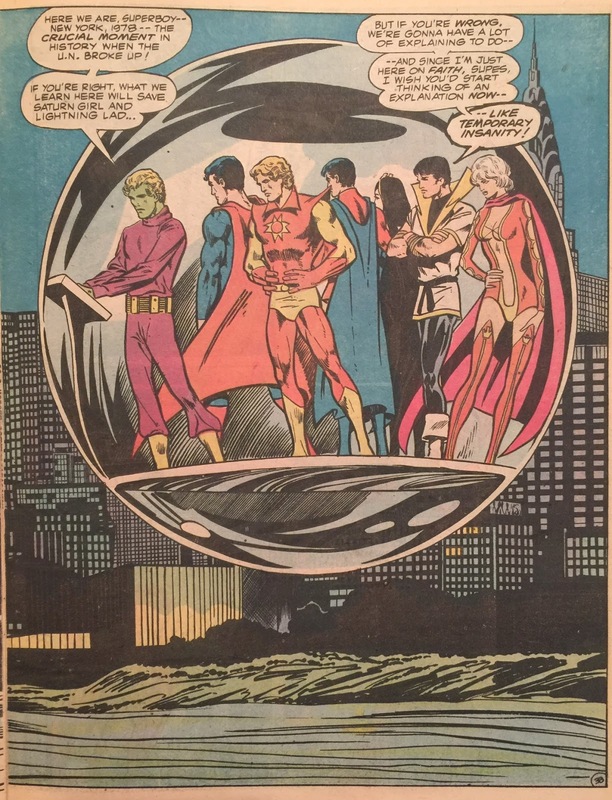 If I had seen, like a young Doug, I would have begged for the money to get it, as even the regular issues of Superboy and the LoSH were infrequent on the spinner racks where I was growing up (cue the sad violin music to lament spotty 1970s distribution...) and that cover is spellbinding. Too bad, though, that the actual content doesn't live up to the packaging and hype. 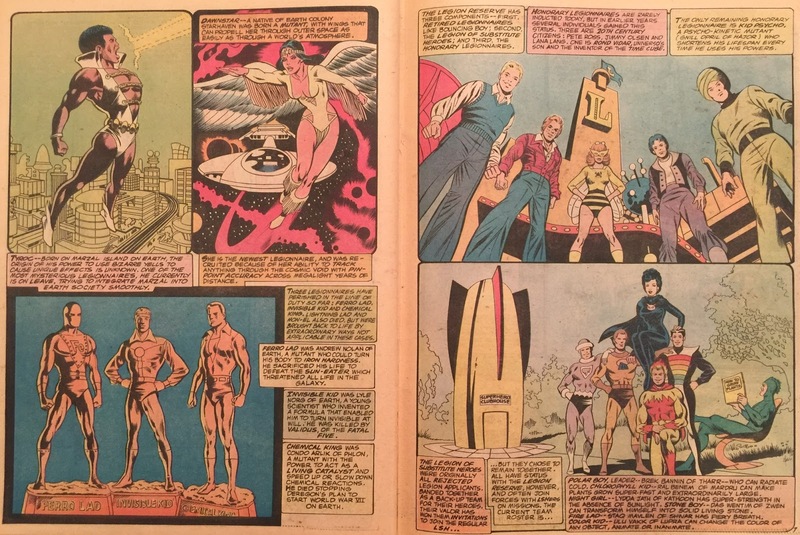 I don't think you're on Twitter, but I have to laugh... your last two comments about the bios being reprinted in the digests and about Element Lad's Kirby-like togs were brought up by separate people earlier this morning! Great minds and all that. 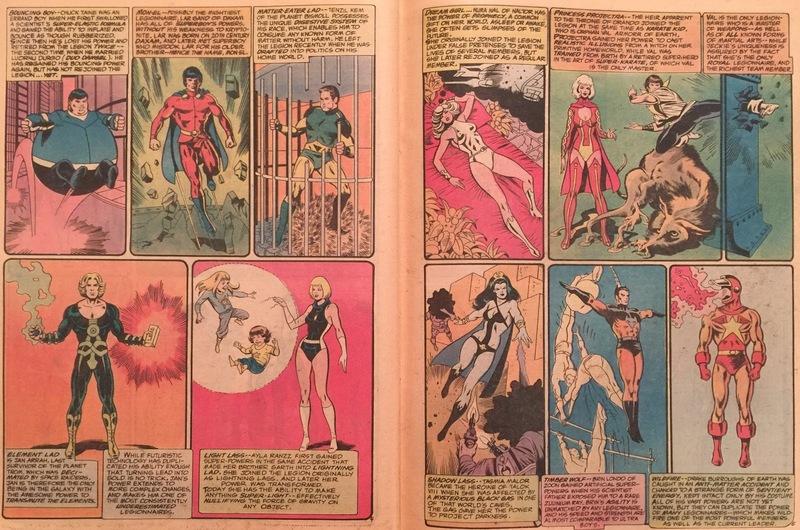 When I sold my comics a few years ago, I was surprised at the gaps in my Superboy/Legion collection. For whatever reason, I think the distribution problems seemed to affect the DC books more than the Marvels. At least that was my experience. Doug, yeah, I'm not on Twitter, but I do occasionally check out the BAB feed to see what's up and read some of the comments. You just made me go check that post - also interesting to see that someone else remembers the bios being reprinted in a digest later. Yeah, for a wedding issue it's not as spectacular as it could be. It's been a long time since I read this, but I don't remember seeing those back-ups before; I must've read a reprint. Great seeing the "dynamic duo" back together again. And a great review. I think I have that treasury edition in a box somewhere. I'm going to see if I can find it. 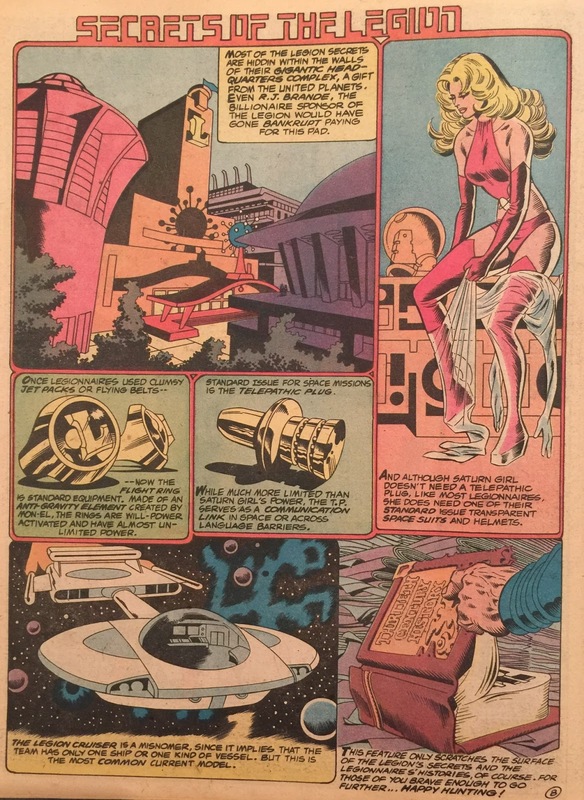 Grell was at his best when inking his own pencils. 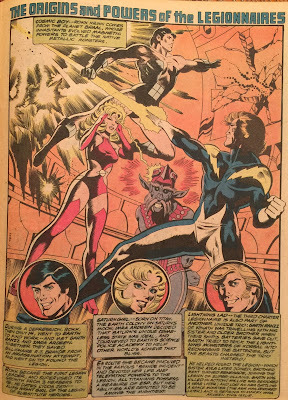 I can remember getting issues of Green Lantern's book back then, seeing that usually excellent Mike Grell cover and being disappointed when I saw that Colletta was inking. I did like him with other artists, but he didn't do Grell many favors. Nice to have y'all back for a bit. Karen and Doug - thanks for jumping back into the blogging fray, even for a short time. It’s good to have you back. 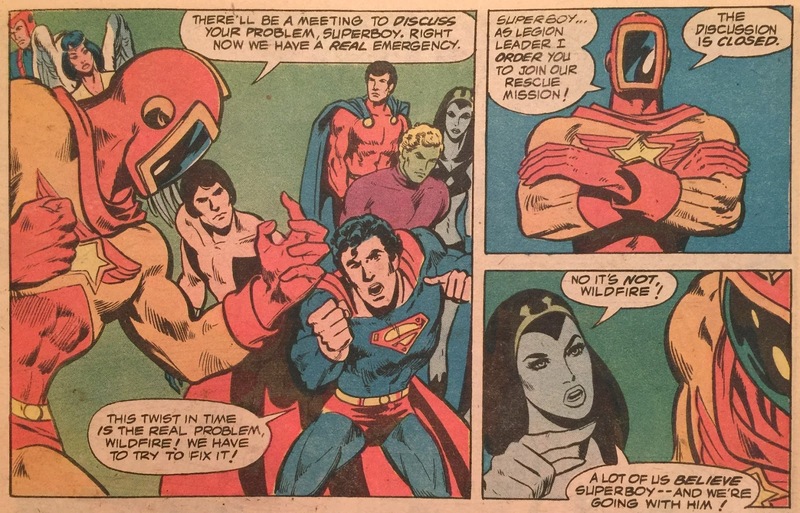 I’ll be the first to say I know almost nothing about Superboy and the Legion. I wonder why it was that I never recall seeing them in any form on the spinner rack when I was a kid. I literally only became aware of any details about them just a few years ago. Question - to long time followers, was the size of the team and number of characters distracting? Was it typically well balanced and was most of the time spent on team interaction? You mentioned that Grell and Wiacek split inking chores - who did you prefer? Or did they stay fairly consistent in style with each other? Great review, Karen and Doug! Detailed, insightful and entertaining. 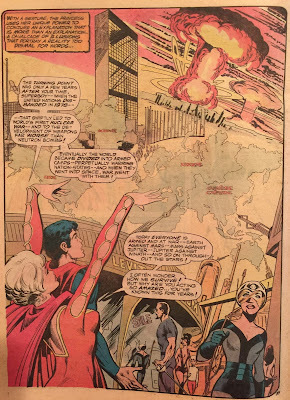 It's just like the Golden Age of Bronze Age Babies! 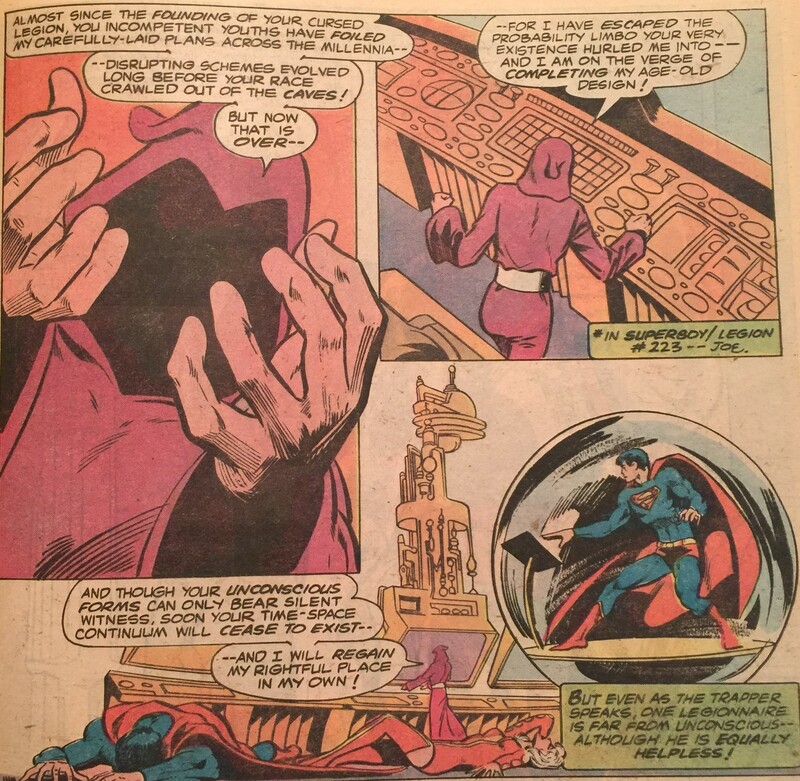 Oh, and wonderful mention of that Mordru story in Smallville. 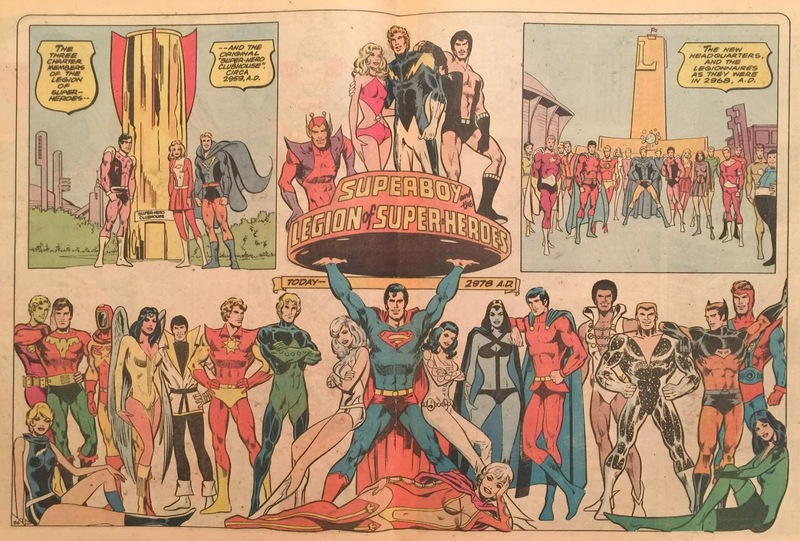 That book is special to me as well, it was one of my earliest comic purchases as a youth and my first Legion story. Still love the bit with Shadow Lass and the ink. 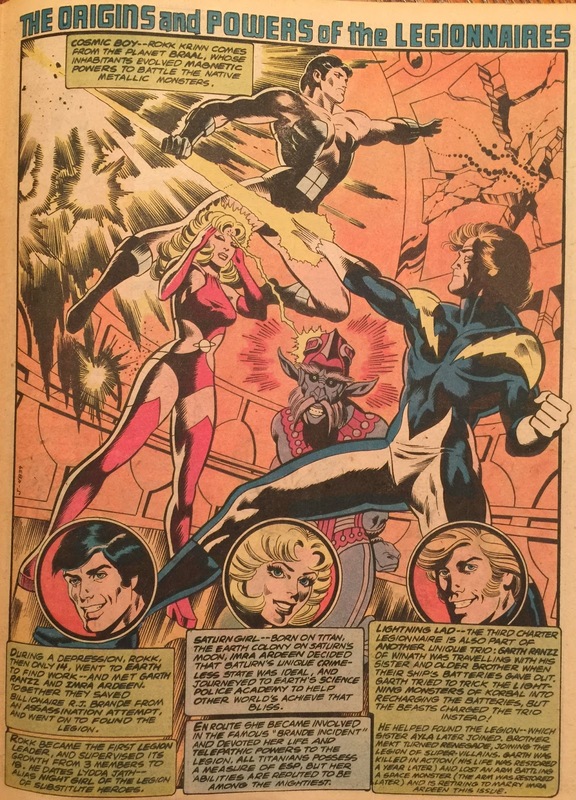 Edo, I can't recall ever seeing Element Lad in that costume anywhere else. I wonder if there were plans for it that got scrapped right when the book went to press? It's not a bad costume but it doesn't say "Legion" to me. 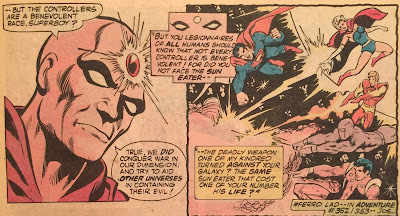 It does look Kirby-esque. 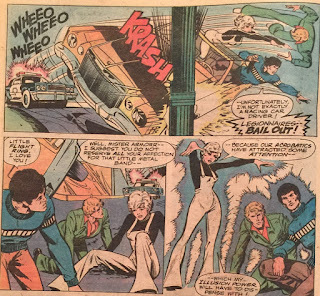 Martinex, typically the team was not so huge in individual issues. 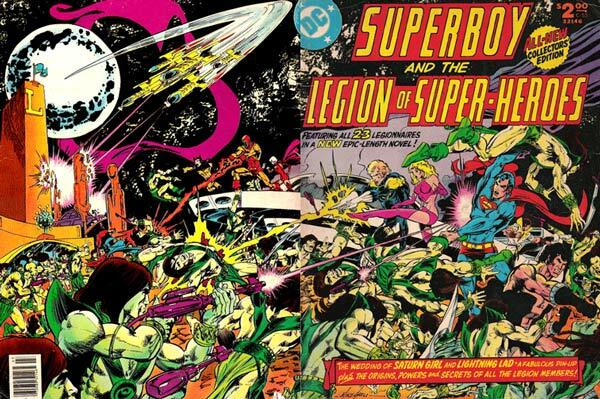 They would be pared down to a more manageable 6-8 characters or so for each story, with other Legionnaires floating around in the background. But never knowing the mix you might get made it exciting! Martinex's comment about never seeing these on spinner racks, which is similar to my experience of only seeing them occasionally, makes me wonder: did Superboy and the LoSH have lower circulation in the early to mid-1970s? 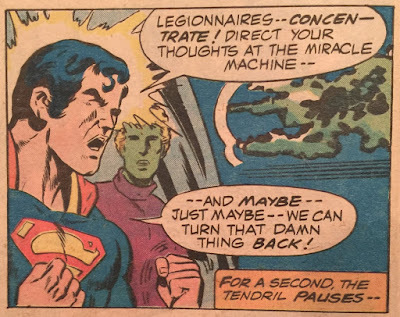 I recall that I only began seeing the Legion on the spinner racks regularly, like every month, sometime in the later '70s, just before Superboy was taken off of the title. For some reason I quit getting email notifications of comments midday yesterday. From Tom on down through Edo I had no idea! Talking about missing out on some conversation!! 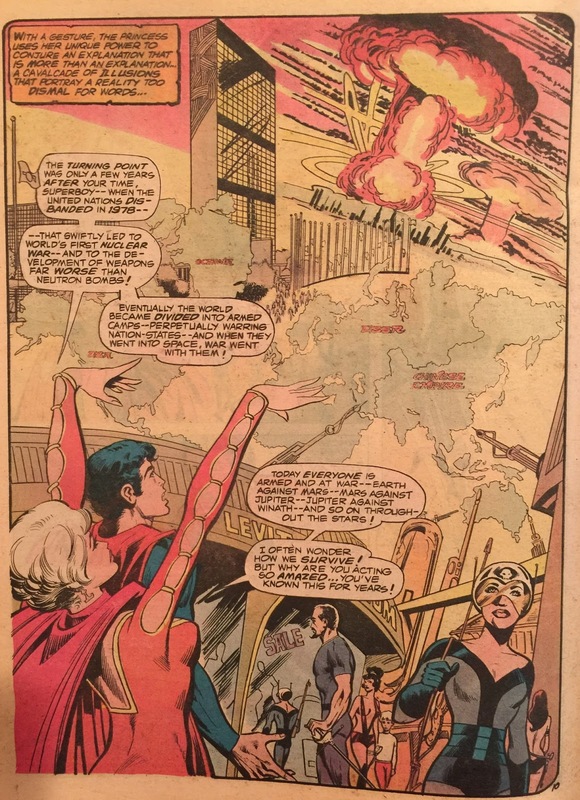 Edo, I would agree that Superboy/Legion, along with many DC books, were much more subject to the distribution woes of which we often complain than were Marvels. 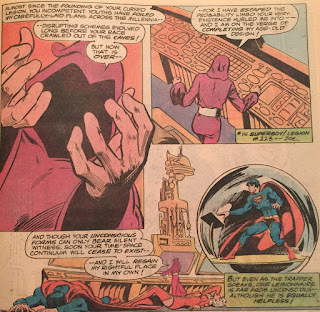 I remarked above about this - I know I had a hard time finding Secret Society of Super-Villains and even Batman and Detective. But if I went to a different store, who knows? 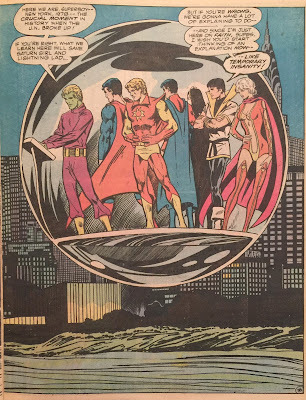 You could find Giant Super-Team Family sitting there just waiting to be scooped up! So I'm not sure what the deal was. Did retailers place specific orders for books? Or did they just check a box and the distributor sent out whatever they felt like? One of childhood's mysteries. Anyway, thanks to all for the comments and for welcoming us back. It's been so good to hear from all of you. And yes, we're missing a few, but it's been a fun week! I have recently read this story in the HC version. 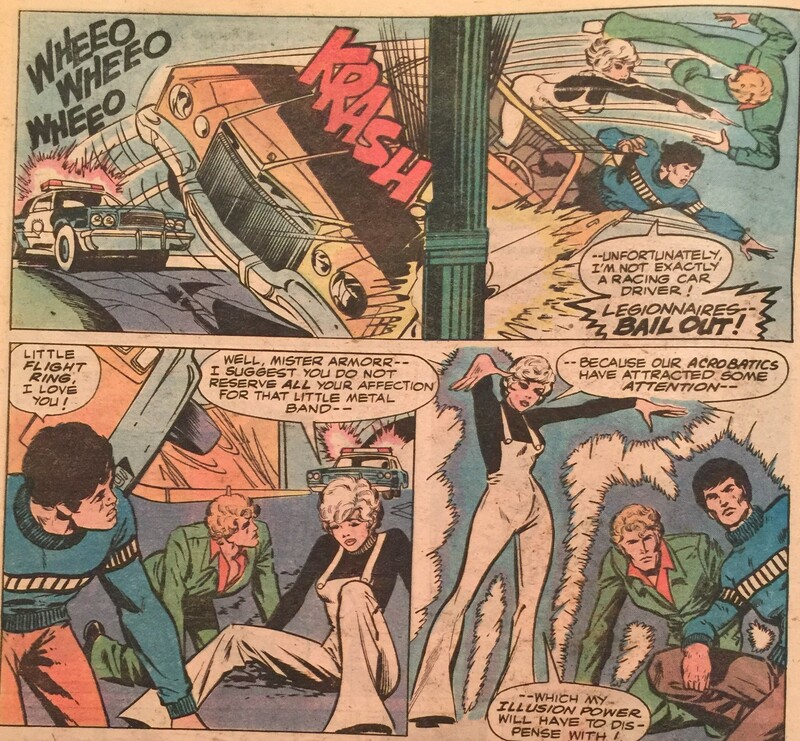 Levitz's early stories really relied on people being idiots, as in, why did the Controller not destroy or at least capture the downed Legionnaires at the end of chapter 3? 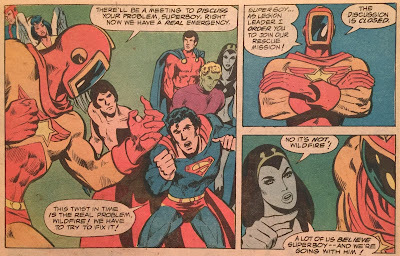 Superboy couldn't stop him. Also, Levitz did very little to elevate the female Legionnaires at this time. Saturn Girl could sense the Lunarites minds, but she couldn't sense when the Legionnaires were close by and summon them? Also, I don't like the limitation that Dawnstar can't track on a planet or moon. I guess he needed to give her a limitation so she didn't just become a plot voucher. But Cos (a man) saves the day with some weird psuedo-science that Ayla has residual EM powers. ALTHOUGH I guess it can explain how she got her lightning powers back. I doubt Levitz would have remembered that though. Same for Jeckie who actually gets used more effectively in chapter 3 as she is able to hide their presence from human perception, which she would later do as Sensor Girl. I am not a fan, however, when Tinya and Vi are both taken down easily by the Controller. Tinya should literally be immune to such things in her phantom form. I used to have this, then lost it over the years, then had to re-purchase it a couple of years ago. I still love it, and will overlook any flaws. Coming late to this party, but I have to ask... in the wedding scene, are the two guys in the lower corners Levitz and Grell? It's as if Alfred Hitchcock had yelled "HEY, EVERYBODY, LOOK AT ME! I'M ALFRED HITCHCOCK!!!" while doing one of his trademark cameos. Even Stan Lee isn't this intrusive. And I agree that the scene isn't a patch on the Bouncing Boy/Duo Damsel one from a few years earlier, whether Colletta or someone else is to blame. 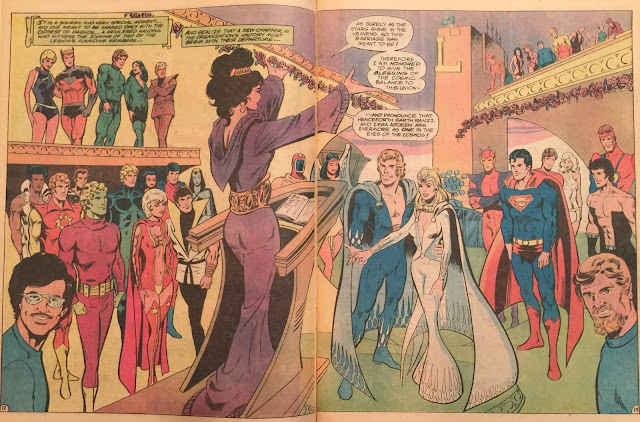 Maybe you can justify the underpopulation by saying Luornu wanted a big wedding and Imra preferred close friends only? Thanks for this article. 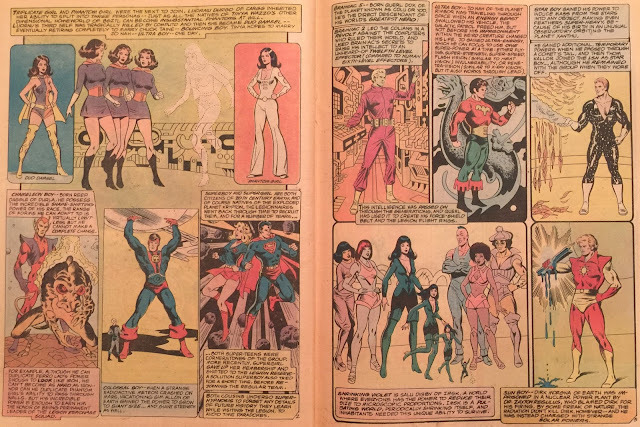 I too grew up with comic books in the 1970s. Gulf Shores Fishing Charter company has a great collection from the 1950s and 60s.